The first phase of the government-subsidized plan to build heavy industry in Jefferson County, West Virginia. Rockwool Group is a multibillion dollar multinational corporation headquartered in Denmark and traded on the Copenhagen stock exchange. Their primary product is mineral wool, a kind of insulation made by melting stone and slag, then spinning it into insulation fibers and binding them with various chemicals including formaldehyde. The process is very energy intensive and has a large toxic emissions and trucking footprint. In 2017, Rockwool worked in secret with the West Virginia state government and a handful of local officials on a plan to misuse federal grant money and gut local zoning and tax laws to benefit the company. 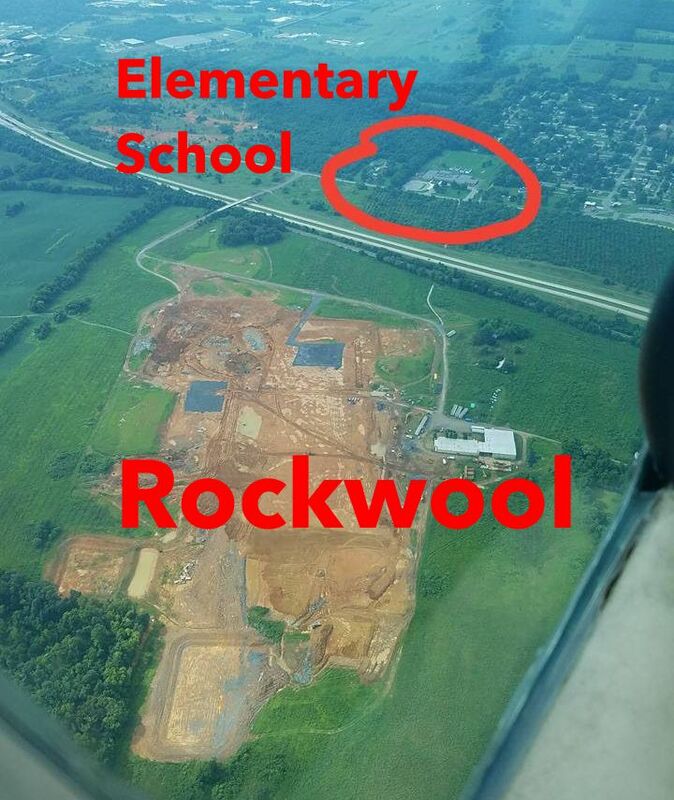 The government is subsidizing Rockwool's plan to build a global-scale factory on an apple orchard by an elementary school in the middle of Jefferson County. Located between Kearneysville and Shenandoah Junction, Rockwool's plant will operate 24/7. Its giant 21 story smokestacks will redefine the county’s skyline, and Rockwool's toxic air emissions profoundly threatens our public schools. If built, Rockwool will mark the end of Jefferson County as a clean and safe residential and agricultural community. In November 2018, Rockwool CEO Jens Birgersson told analysts that, “There are more than 5,000 people there [Jefferson County] that really, really needs jobs in our factory. They really need it.” What is the basis for this claim? Jefferson County’s unemployment rate (~ 3%) is lower than the U.S. as a whole and median household incomes are higher than the U.S. (and Denmark). Large employers in the region are struggling to attract and retain similarly skilled employees. Rockwool is the wrong strategy for jobs and growth. The location is a former apple orchard 2,300 feet from an elementary school in a residential and tourist growth zone. The property was zoned for a mixed use sustainable community. The site lacks industrial water, gas, and sewer service, and does not have appropriate road infrastructure. It is located on sinkhole prone karst geology, creating groundwater risks county-wide. There is no other heavy industry at this scale in Jefferson County. Rockwool has committed to fund a student health study and long-term school air pollution monitoring. Rockwool and its government allies used a secretive process to obtain permits, state funding, and zoning and tax changes. Most of the officials involved in this initial process have resigned or lost re-election. There was no general public workshop about the project impacts until August 2018, after vocal opposition had already emerged. Since then, twelve towns and cities in the region, including the county seat of Jefferson County, have voted to declare opposition Rockwool. Opposition groups are litigating the project’s waterline, tax abatement, and zoning changes. Rockwool received state-wide media coverage of multiple stormwater control and sinkhole disclosure violations. The 2018 elections in Jefferson County largely turned on the issue of Rockwool, with 5 of the 6 races won by candidates pledging to oppose Rockwool. In the wake of the elections, twelve pro-Rockwool officials on the county development authority (JCDA) resigned. The JDCA is supposed to manage Rockwool’s waterline and tax abatement programs. In January, the state of Maryland blocked construction of the natural gas pipeline which would provide gas to Rockwool. There is currently no plan to provide gas to the Ranson site. Charles Town elected officials have repeatedly delayed construction of an industrial sewer line for Rockwool since last summer. Over 1,000 Charles Town freeholders have signed a petition in protest to the project's sewer bond. In January 2019, Rockwool abandoned its deal for a government provided waterline and is now attempting to fund and construct the waterline construction directly. Jefferson County protesters attended industry events in New York, Pittsburgh, Greenbrier, Huntington, WV, and Washington, D.C. In Sept. 2018, Rockwool cancelled a large day-long event scheduled for Washington, D.C. to avoid protests. The company’s current strategy of rushing to construct and hoping to “mutually coexist” will fail in Jefferson County. The opposition-- a large majority of the county-- is sophisticated, organized, and prepared for a multi-year legal, media, and political battle.